THIS study deals with Muhammad Ali Jinnah’s marital life and its tragic break up, resulting finally in the death of his 29-year-old young beautiful and highly talented wife, Ruttie. Originally published in Urdu, this slender book of 15 chapters with 140-page text is now made available in English. The division of chapters is puzzling; some of these cover only two or three pages. The author, Razi Haider, claims his study "to be the first work throwing light on his (Jinnah’s) private life". Ruttie belonged to a distinguished aristocratic Parsi family of Bombay. Her father, Sir Dinshaw Monockjee Petit Bart (1873-1933), a fabulously rich textile magnet, was Jinnah’s close friend. In the summer of 1916, when Ruth was 16, Jinnah accompanied Sir Dinshaw’s family to Darjeeling for a two-month holiday. In Darjeeling, Ruttie’s alluring beauty, her sparkling intelligence, vivacity, and uninhibited laughter cast a spell on Jinnah. Later, Jinnah’s proposal to Sir Dinshaw for marrying his daughter infuriated him. Jinnah was more than twice Ruttie’s age, about 41 years old. On her 18th birthday, Juliet like, Ruttie left her parents to join Jinnah. 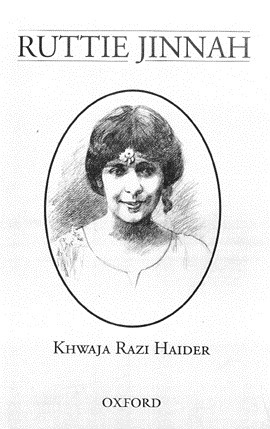 She was married under Muslim rites on April 19, 1918, at Jinnah’s spacious house ‘South Court’ on the Mount Pleasant Road atop Malabar Hill in Bombay. Jinnah gave his wife a marriage gift of Rs 125,000. The Parsi community was outraged at Ruttie’s marriage to Jinnah. Sir Dinshaw did not attend her marriage nor her funeral in February 1929. Sarojini Naidu, a close friend of Jinnah and Ruttie was regarded as the "Nightingale of Bombay", and Ruttie the "Flower of Bombay". On Ruttie’s marriage, Sarojini Naidu quipped that a "blue flower Jinnah has plucked". The Raja of Mahmudabad called Rutti "a fairy of Koh-i-Qaaf". Dewan Chaman Lal, a Panjabi aristocrat, a legal luminary and flirtatious adventurer extremely popular with upper-class woman said lyrically after Ruttie’s death, "there is not a women in the world to hold a candle to her (Ruttie) for beauty and charm". Endowed with artistic sensibility, Ruttie was a highly sophisticated women, full of life, pulsating with fiery passions in her veins. She would radiate her charm and regale her elitist circle of friends with her flashes of wit and quick repartee. She was as much European in taste and style as her smartly dressed Saville Row and suede shoe-wearing tall, handsome husband, puffing his pipe with puckered sense of concentration. Jinnah had married first in 1892 when he was a school-going boy. His wife died, and thereafter he led the life of a recluse till he met Ruttie. When married, Jinnah was already acknowledged as a leading barrister in Bombay. He was a member of the Viceroy’s executive council and president of the Bombay Branch of the Home Rule League. Acknowledged as an ambassador of Hindu-Muslim unity for the Lucknow Pact (1916), he won plaudits in political circles, though the pact was essentially communal, making separate electorate a constitutional right of the Muslim community, which subsequently opened the door to the partition of India in 1947. The Lucknow Pact shows Jinnah truly in his sectarian colours which historians generally ignore. Jinnah and Ruttie spent their honeymoon in Nainital. With her artistic skill, Ruttie renovated her bungalow. The couple moved in the highest official and political circles, including the viceroys and governors. Gandhiji advised Ruttie to wear khadi and speak in Gujrati. The author twists Gandhiji’s proposal as a cunning device on his part to wreck Jinnah’s marriage, which is absurd. Gandhiji was exhorting his compatriots with passionate zeal to do the same. The author cites an incident showing Jinnah’s high sense of self-respect. Jinnah and his wife were invited for supper by the Governor of Bombay, Lord Wellingdon. For the occasion, Ruttie wore a low-cut evening gown. Seeing it, Lady Willingdon asked an ADC to bring Mrs Jinnah a wrap. Jinnah retorted that if Mrs Jinnah needed a wrap, she would ask for it; and, instantly, escorted his wife out of the Government House. Haidar shows how in recognition of Jinnah’s bold agitation against a farewell meeting held in honour of Lord Willingdon, the citizens of Bombay built the Jinnah Memorial Hall in the Congress compound. In the last section of his book, Haider explains the reason for the collapse of Jinnah’s marriage. According to the writer, the reason for the tragic end were the temperamental and age difference between Jinnah and Ruttie. This explanation is simplistic. It is clear in the light of scant evidence that Jinnah and Ruttie began to drift apart nearly six years after their marriage. The passionate sensual glow of the conjugal partnership wore off in the dailiness of dreary life. A hard-faced private person, dry, dour, cold and calculating, Jinnah was a formidable personality wrapped in public life to the exclusion of all other interests. On the contrary, Rutti was an extrovert, cherishing her dreams and fantasies, and moving with gusto in a wide circle of the high-class sophisticated Bombay society. It was natural, indeed, that Jinnah’s icy aloofness and autocratic temper would suffocate Ruttee. Something snapped within her. What could she do? Poor, Ruttie! Where to go? She left her life empty! Vijaylakshmi Pandit wrote that she needed "liberation". Ruttie began to be haunted by insomnia and hallucinations. She sought solace in telepathy, s`E9ances and clairvoyance. When Jinnah’s daughter, Dina wanted to marry a Parsi youth, Nevile Wadia, Jinnah warned, "You will cease to be my daugther". When Ruttie was lying dangerously ill in the Champs Elysee clinic, Bombay, Dewan Chaman Lal made a special effort to patch up differences between Jinnah and Ruttie, but he failed. Ruttie died in the Taj Mahal Hotel on her 29th birthday in 1929. 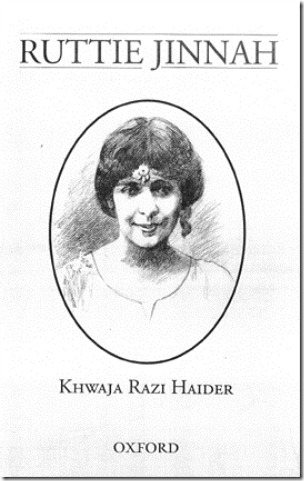 She was buried at the Khoja cemetery of Mazagaon in Bombay according to Muslim rites. M. C. Chagla wrote that at her burial, Jinnah was discussing his own political activities. In Jinnah’s political vocabulary and in her social relationship, the word "compromise"never existed. He must settle issues on his own terms.